Drew Blythe Barrymore (born 22 Februar 1975) is an American actress, author, director, model an producer. She is a stryndant o the Barrymore faimily o well-kent American stage an cinema actors, an is a granddochter o actor John Barrymore. 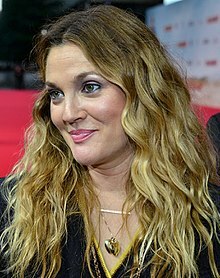 ↑ 3.0 3.1 "Drew Barrymore Biography (1975-)". FilmReference.com. Retrieved 2014-04-22. Wikimedia Commons haes media relatit tae Drew Barrymore. This page wis last eeditit on 28 Mairch 2017, at 04:46.